PHOENIX – The capacity crowd at Wrigley Field in Chicago watched as Cleveland Indians second baseman Jason Kipnis faced off against Cubs relief pitcher Travis Wood with two runners on base and two outs in the seventh inning of Game 4 of the World Series. Wood went into his windup and released the pitch. Indians fans in attendance exploded with cheers as the Kipnis blast found its way over the right field wall and into the crowd. That three-run shot gave the Indians a 7-1 lead over the Cubs and Cleveland went on to win Game 4. It also put the Indians on the brink of their first world championship since 1948, giving them a 3-1 lead in the series. But the Cubs won Game 5 in Chicago and despite another offensive outburst from Kipnis in Game 6 in Cleveland Tuesday night, when he singled, doubled and hit another home run, the Cubs evened the series with a 9-3 win. Wednesday night, Kipnis and the Indians face the Cubs in the decisive Game 7 at Progressive Field in Cleveland. Through the series’ first six games, Kipnis has 8 hits in 26 at bats, including the 2 home runs to go along with 3 doubles. He has 4 RBIs and has scored 5 runs in the series. In the regular season, Kipnis hit .275 with 82 RBIs and a career-high 23 home runs. Seeing Kipnis produce big hits is nothing new to Arizona State baseball fans. 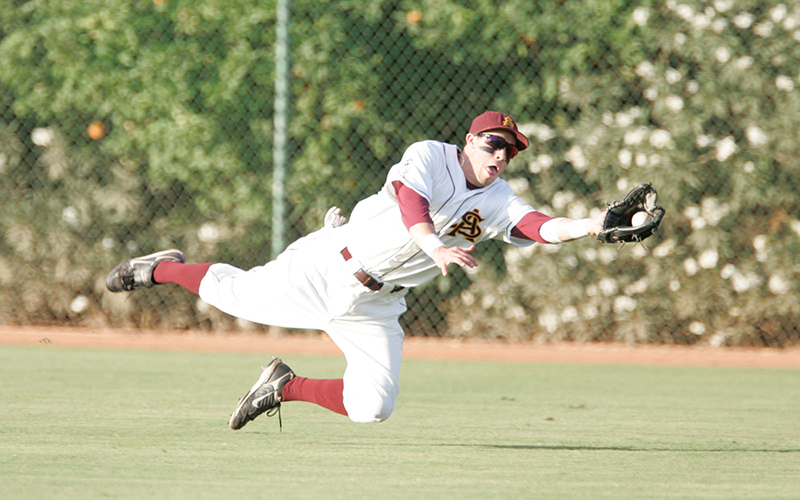 Kipnis transferred to Tempe from Kentucky and helped the Sun Devils compile a 100-27 record during two seasons with the Sun Devils in 2008 and 2009. “I think right away, when we saw him, honestly I was trying to figure out why Kentucky let him go, because he was a pretty skilled player,” said Andy Stankiewicz, an assistant at ASU from 2006 to 2009 who is now the coach at Grand Canyon University. While Sun Devil coaches were confident that Kipnis had the potential to impact the team, they said he was less sure of what he could accomplish. “Jason came into our program and he was uncertain how he would be, and he proved himself,” said Pat Murphy, who was ASU’s head coach at the time and now serves as bench coach of the Milwaukee Brewers. Kipnis brought more than talent, however. The Indians second baseman played centerfield at ASU due to a logjam of talent in the infield and hit .378, recording 152 runs, 30 home runs, 144 RBIs and 51 steals over two seasons, according to The Baseball Cube. Kipnis, a Chicago native who grew up a Cubs fan, also won what was then the Pac-10 Conference Newcomer of the Year and Pac-10 Player of the Year honors during his tenure in Tempe. His energy is what set him apart from other great Sun Devils on the team, such as Ike Davis and Brett Wallace, according to Stankiewicz. Since his time with ASU, Kipnis has evolved into one of MLB’s most dangerous second basemen. Drafted in the second round of the 2009 MLB Draft by the Indians, Kipnis is a two-time American League All-Star and has received votes in AL Most Valuable Player balloting twice. Despite being relatively undersized at 5 feet 11 inches and 195 pounds, Kipnis has produced at the big league level. Those who know him won’t be surprised if that burning desire to do anything to help his team win leads to Cleveland hoisting the Commissioner’s Trophy at the end of Game 7. Murphy believes the effort Kipnis brings is contagious. Beyond the diamond, the 29-year-old is known as a energetic and witty personality who keeps things loose in the Indians clubhouse. “He’s a good guy that gets along with everybody in the clubhouse and does and says the right things at the right time,” Rickon said. Kipnis has made headlines this postseason by saying the 2016 Indians deserve a movie, showing off his severely swollen left ankle after his victory in the American League Championship Series, revealing that he has been a Cubs fan for all of his life and coming to the defense of Steve Bartman, the infamous Cubs fan who interfered with Moises Alou’s attempt to catch a foul ball during the 2003 National League Championship Series. Rickon said that Kipnis has a sense of humor that makes him a media darling. According to Stankiewicz, Kipnis has the kind of personality that makes him a guy who is easy to root for.